Gold Coast Flood Restorations can provide individuals which would rather do the work themselves with the specialized devices and direction they need to get the job done. Our drying equipment rental is a cost effective way to finish a project if you are paying out of pocket or working off a deductible. This is also a great program for other contractors, builders, remodeling contractors, and handymen to add structural drying to your professional service portfolio. 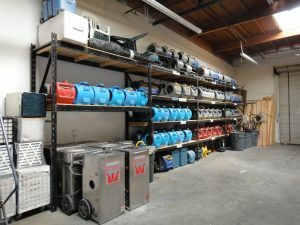 We rent out transportable extractors, fans, dehumidifiers, and other types of cleaning or drying equipment available for you to perform your own project. Along with the equipment we can send one of our certified technicians to your job to help you identify what is wet and what equipment is required. When the structure is dry, a technician will return to verify that everything is dry, present you with a Certificate of Completion, and pick up the remaining equipment. What should you do when you experience a flood, spill, or other water damage? Gold Coast Flood Restorations hires highly trained, certified technicians and managers to assure thoroughness in remediating damage to homes and businesses disturbed by water, sewer and mold. Below are valuable water damage tips from the professionals. Disconnect and take out all small electrical appliances, lamps, etc. In summer turn on the AC. In winter, heat the area to 74 ° -76 °. Turn on ceiling fixtures if ceiling is wet Keep out of spaces where ceilings seem wet. Water can severely damage the structure of your home or business. We strongly suggest seeking the advice and assistance of restoration company before opting for drying equipment rental on a major cleanup and restoration project.